It’s an early Monday morning and I bet a lot of you are settling in right now at your desks to start the work day. I have a nice, steaming cup of coffee sitting here on my desk and I’ve been guzzling it down. I’m eager to get the day started with all of you and I hope you’re eager to get it started with me :). Lately, I’ve been sharing a lot of animal optical illusions. One of the animal optical illusions I posted up last week actually got a good bit of attention, because most of you thought the bird legs optical illusion was just too cute, because we all know why this bird has legs under her. There are little baby birds under her that she is protecting. To me, that illusion is just way too cute! I hope you like today’s animal optical illusion I’m going to post up, as well. Check it out by scrolling down. At a quick glance, this illusion could definitely throw some people off. I don’t know about you, but I think llamas are cute animals anyway, so this optical illusion is pretty funny to me. I hope all of you enjoyed it, as well. Do you want to see another animal optical illusion? Check out these camouflaged toads! 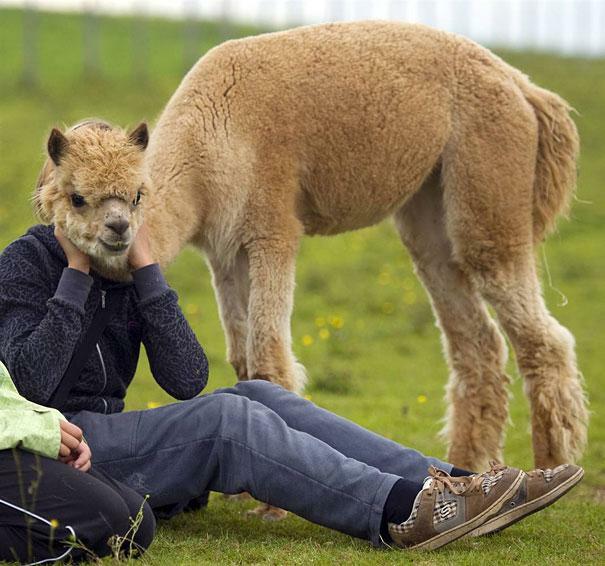 It’s an alpaca, not a llama. Just sayin’. Cute picture, tho!